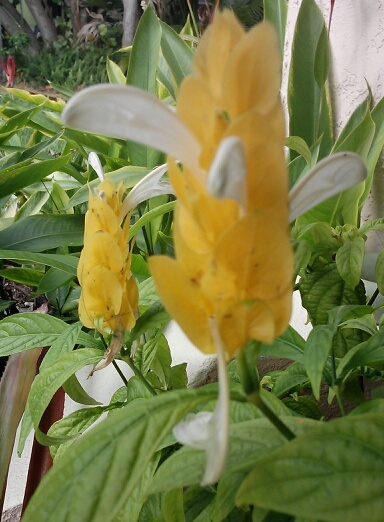 This plant appeared in my garden a couple of years ago. I thought it was some sort of Amaranthus blown in from across the Atlantic Ocean and decided to leave it to see what happened. Amaranthus can have some interesting flowers (Love Lies Bleeding, etc.) The foliage started getting red around the edges, confirming my thoughts, then the stems started getting woody. Maybe it wasn’t Amaranthus at all. Definitely not an Amaranth. Not a clue what it was. So, I took this to the Native Plant Society meeting and they said Firebush. Hamelia patens var patens? 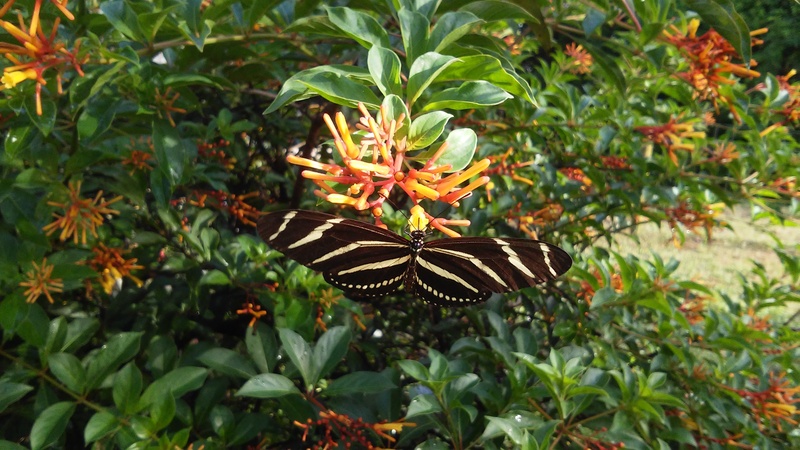 I said no, it couldn’t be, this is my Firebush, Hamelia patens. Orange flowers and the leaves are half as big. Then it dawned on me, there is a great deal of arguing about the true native Firebush. I usually ignore this kind of argument being more designer than botanist, but think I am agreeing with the Hamelia patens var patens crowd. The orange flowering one is supposed to be from the Caribbean somewhere instead of Florida. Given the seemingly magical appearance of the patens var patens in my garden, I think that the red one is the native. Mother Nature really is a good designer, she placed the Native Red Firebush in a bed of red and yellow Heliconias behind some yellow Beach Sunflowers and across from some red Bromeliads. Perfect. Now if everything would just grow together. And be happy. I am aware ‘Surinam Shrimp’ sounds like a dish at a Vietnamese restaurant, however the two main components of this vase are Surinam Cherries and Shrimp Plants. The Surinam Cherries are the fruit in the lower part of the arrangement. I have a large hedge of these shrubs and was pleased to have a fruit producing hedge, thinking (silly me) the fruit could be eaten. I kept thinking the fruit wasn’t ripe or something as it tasted so bad. Finally my neighbor, a Florida veteran, picked one for me – properly ripe. Still tasted bad. I have seen the taste described as resinously bitter, and the description fits the fruit. Given the taste of the fruit and the colors in various stages of ripeness an arrangement seemed like a better use of the fruit. The rest will be left for our wildlife friends. Here is another view with the nearly ripe Surinam Cherry beside the vase. As for the other members of the plant crew, we have: in dark red, flowers of the Red Shrimp Plant (Justicia brandegeana); the foliage of Boston Fern and the upright sticks are from a ‘Firesticks’ Pencil Cactus (Euphorbia tirucalli ‘Firesticks’); in orange and chartreuse, the fruits of the Surinam Cherry (Eugenia uniflora). Now I am craving some Shrimp Pasta for dinner. Without the Euphorbias, of course. The rainy season officially started about a month ago here on the Treasure Coast in South Florida. It just didn’t start raining until the past week. Plants were getting crispy and I was having to provide supplemental water, even in the irrigated areas. My appreciation for the native plants has gone up. Here is the native shrub, Firebush, Hamelia patens, not missing a beat and attracting butterflies and a large selection of bees. I have been waiting for precipitation to move plants around in the garden. Now the dilemma is the humidity – it has hit 100 percent several times already., not pleasant gardening weather. Some of the plants are enjoying the heat and humidity more than me. 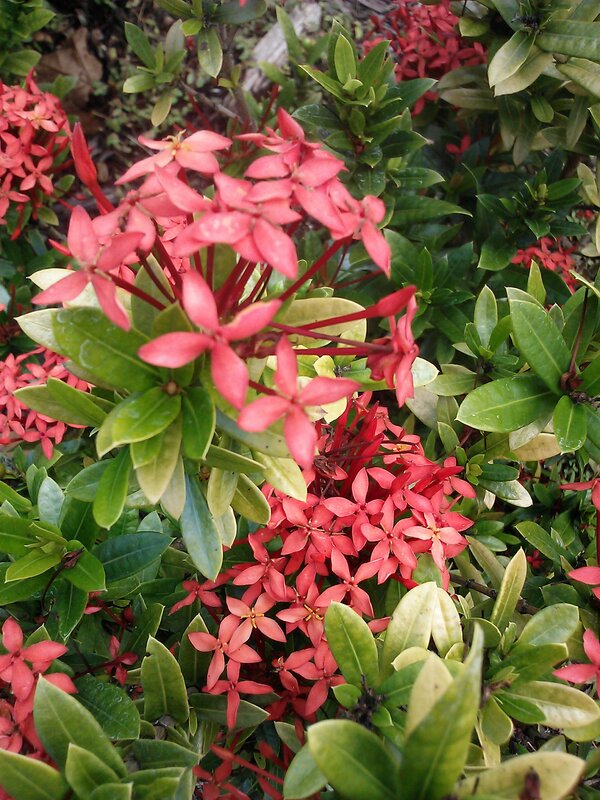 The Ixora burst forth as soon as the rain started, I take back all my grumbling about the special Ixora fertilizer I had been faithfully applying – it clearly works. I can’t recall having a shrub with more flowers, ever. 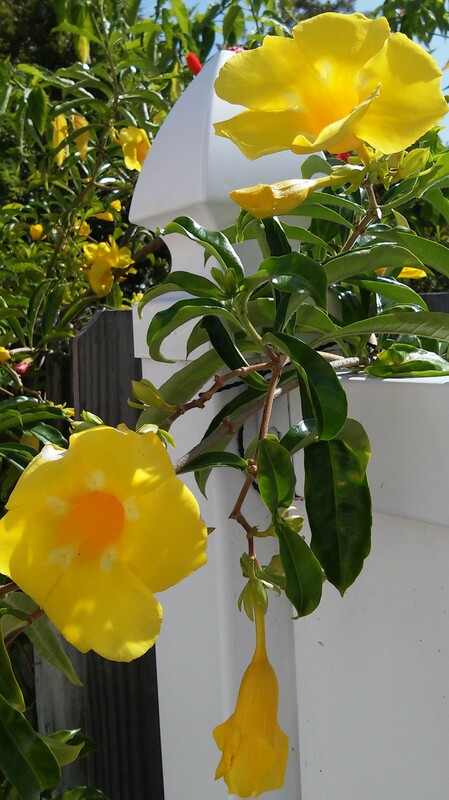 The Yellow Allamanda I trained to the fence liked the rain as well. Interestingly enough, the native version of this Allamanda was completely eaten by caterpillars! I think it hosts a good butterfly, so caterpillars were probably good. 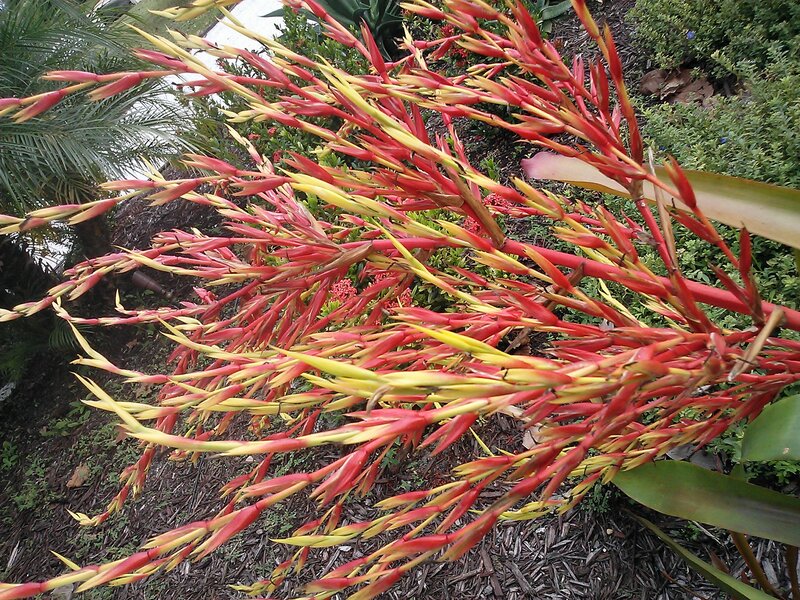 The rainforest Bromeliads also enjoy the summer. 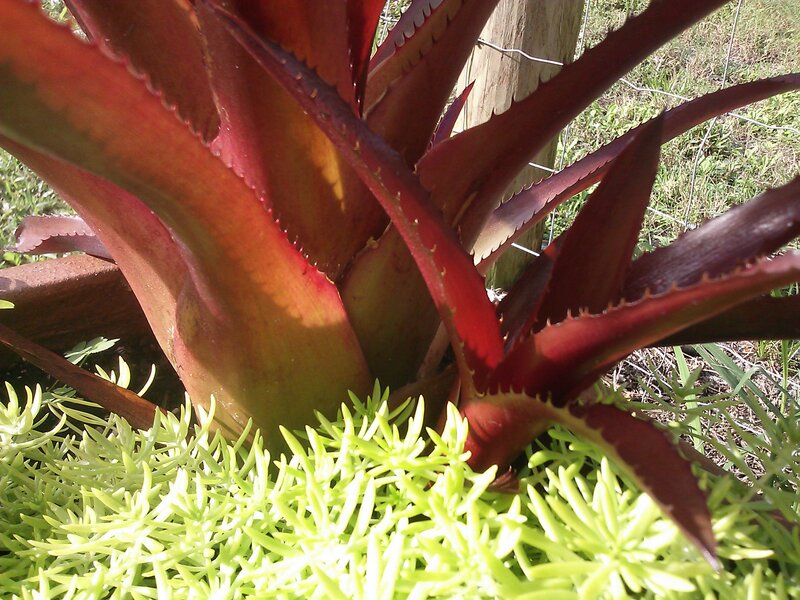 This is a Miniata Aechmea, it reminds me of red hots and is painfully easy to grow. My final happy plant is a container garden actually. 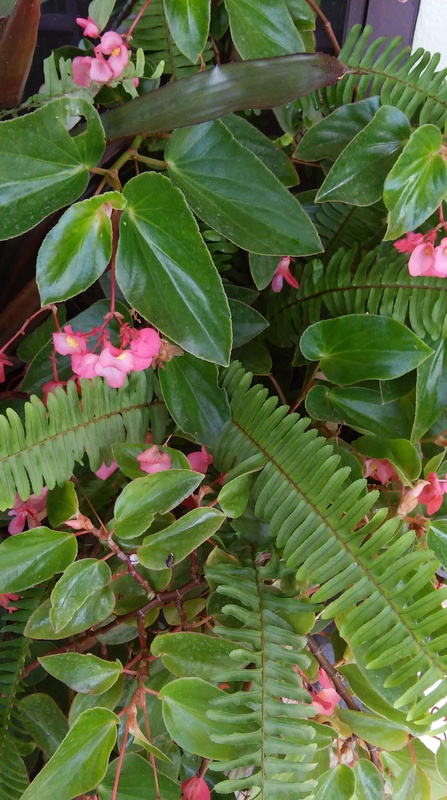 I have had this Dragonwing Begonia around for a couple of years, it was getting puny so I cut it back, found some Boston Fern in the yard (another wonderful native plant, it just comes up!) and put it on my front porch in part shade. Dragon Wing Begonia and Boston Fern. Dragon Wings are a long time favorite of mine and I am happy I can grow them here, where they are apparently a perennial. I rooted some cuttings and they are quite happy as well. Heat and humidity are good for something! I just looked at the weather app on my phone, it said 88 degrees but it feels like 108! I am going to stay inside and perhaps join my dogs on the cool tile floor. Although there is a promising looking group of clouds forming to the south. 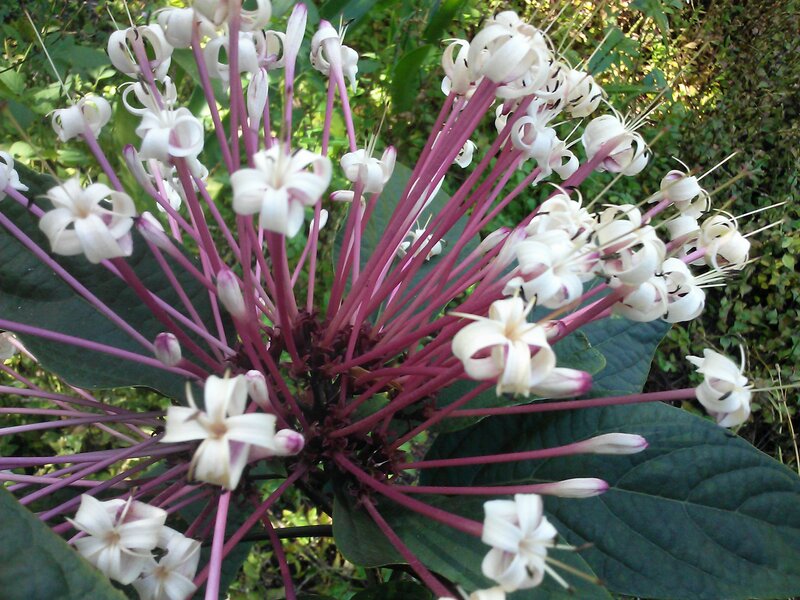 The Latin name for this plant is Clerodendrum quadriloculare. This is an interesting group of plants, ranging in size from vines to perennials then shrubs up to small trees. Mostly native to tropical South Asia and with a tendency towards creepy habits you must be careful who among them is invited into your garden. 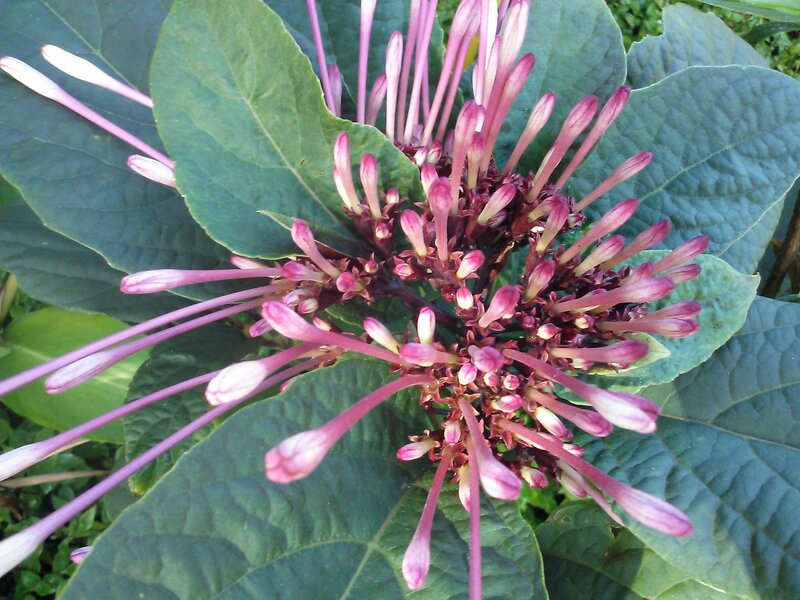 I have seen some gardens overrun by a perennial orange version of Clerodendrum which is beautiful but really creepy. I am glad to have this shrub in my garden, I think of it as a Tropical Rhododendron, and it is so much easier to grow than the cursed Rhododendrons (my former garden had heavy clay that was impossible to grow Rhodos in) The coarse textured leaves have an added bonus of deep plum colored backsides which make the foliage attractive year round. So far the Winter Starburst has not exhibited any bad behavior, I have sited it in the prescribed partial shade, but the soil like substance in my garden isn’t given to over production of anything except Heliconias as of yet. The song by the Rolling Stones goes, and I am paraphrasing “You can’t always get what you want, but if you try sometimes you get what you need.” Sage words. That made me remember I want to plant some sage.. 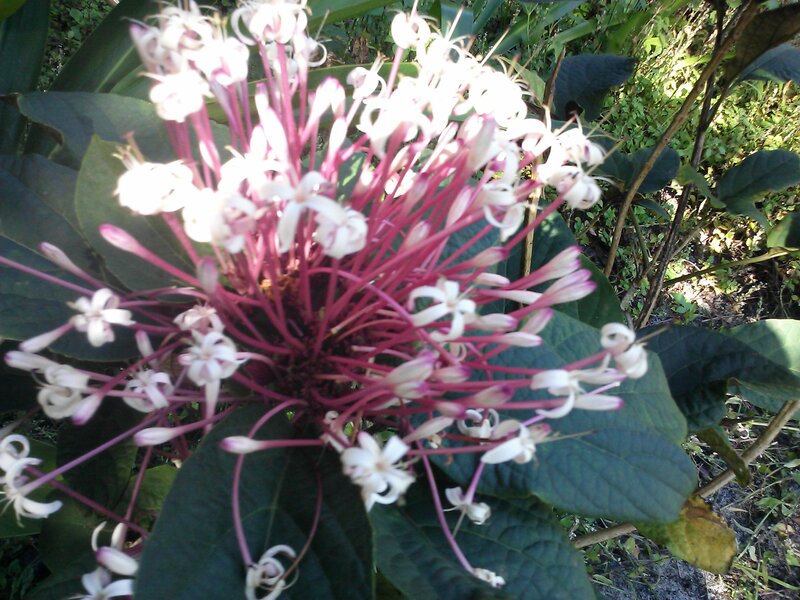 There are many transplants here in Florida – people and plants as well. The people are trying to grow the plants they know from home, maybe 4 hardiness zones north. The plants are unhappy. I was surprised by the number of folks trying to grow Lilacs in South Florida. Lilacs grow in the Northern US, not South Florida. South Florida may be the mold and mildew capital of the world and Lilacs are extremely susceptible. Of course, there are some delightfully fragrant plants that people in the North are trying to grow that thrive here and are really well suited for this climate- on it goes. Ylang ylang, anyone? If for no other reason it would be fun to try this because of the name. I actually had a vanilla orchid for a while, but I think one of my dogs stepped on it. I am as guilty as the next gardener, to a certain extent. I like the new and unusual and there is a lot to see when you move to the tropics. My favorite tree ever, the Autumnalis Cherry, cannot be grown here. I readily accept that because of the other trees that can be grown here. 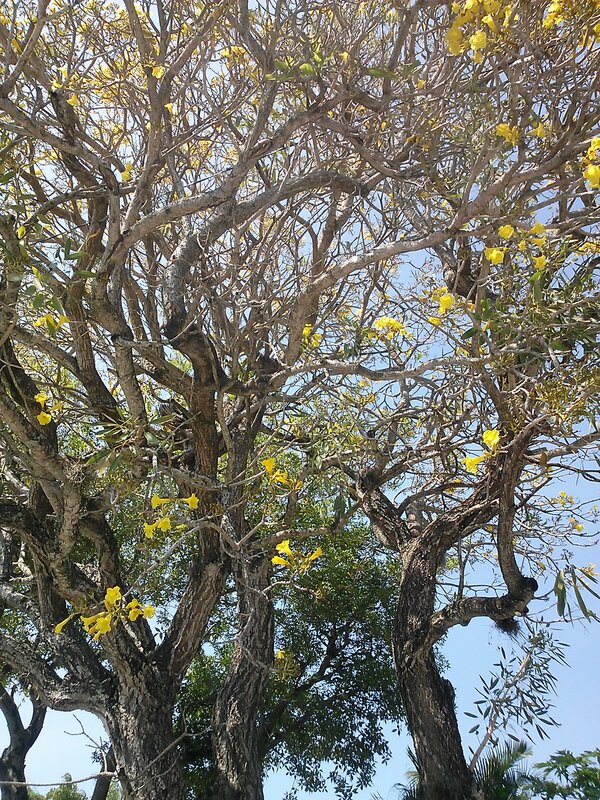 My new favorite is Tabebuia which I have just found with orchid colored flowers – the Ipe Tabebuia. I also like the yellow one because of the nice corky bark. It is a dilemma to choose between the two, fortunately the back garden of my house is, well, um, non-existent. So, I can have either. I have succumbed to Zone pushing by planting some Burgundy Loropetalum. One of my favorite shrubs from the frozen north. 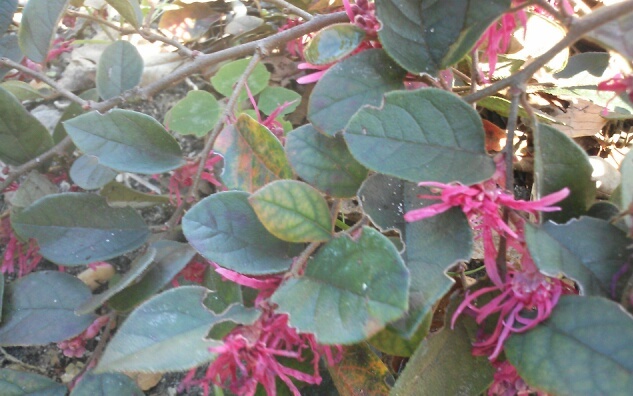 This is not supposed to grow in Zone 10, my research says Zone 9 is it for the Loropetalum. But I found one for 5 bucks and decided to try it. It is cheerfully blooming in my front yard in January. 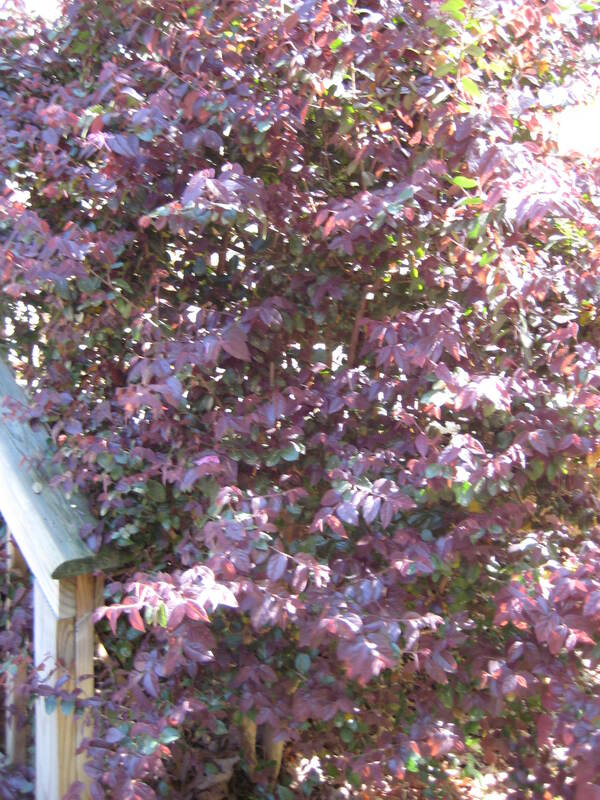 You may notice the Atlanta Loropetalum is robust and more than 6 feet tall. The one here in Florida tops out at 8 inches and looks a bit chlorotic. I guess it is time to wait and see. The turning of the year is a time for taking stock of what you have and looking forward to the future of what will be added to the garden. Here is what is currently in bloom in my garden. 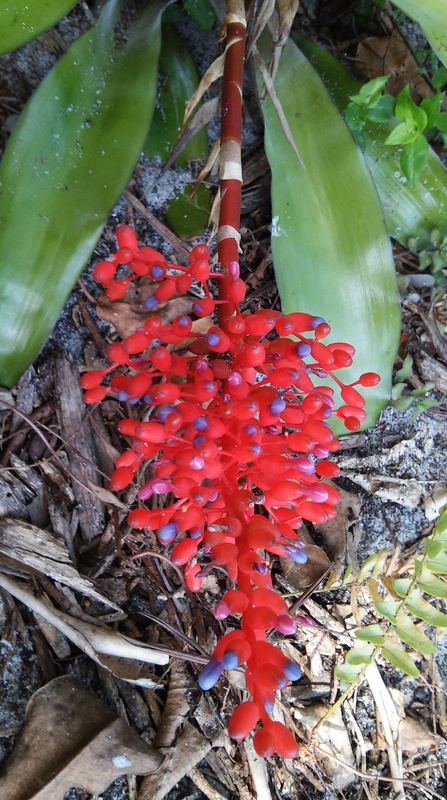 This is an Aechmea Bromeliad and outstanding in its interesting flower. I have a feeling I am going to find out that is a bract or something. 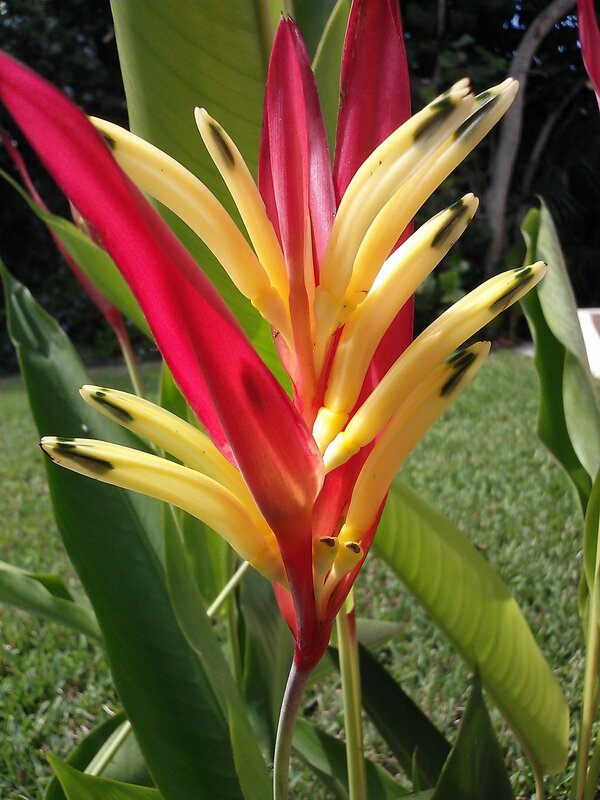 This is an unnamed cultivar of Heliconia, I see it called Parrotflower in the trade. I have yet to see a parrot. 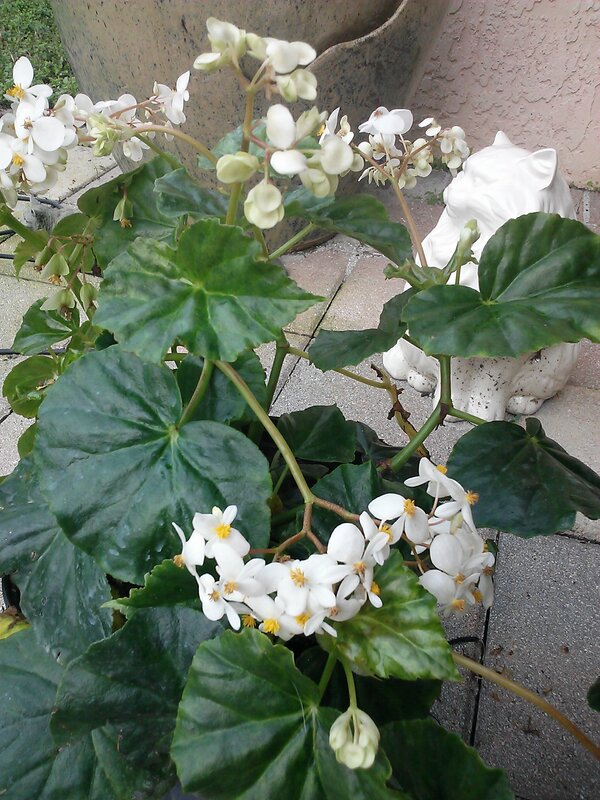 Sweet Begonias are new to me, Begonia odorata, I rarely catch the scent from this, but it has been blooming nearly nonstop since last spring. 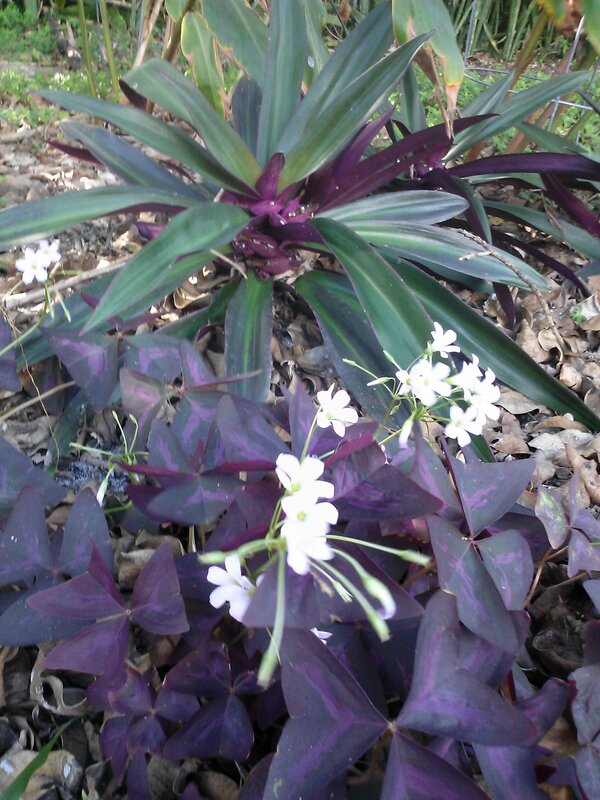 Doesn’t everyone have a Purple Oxalis? 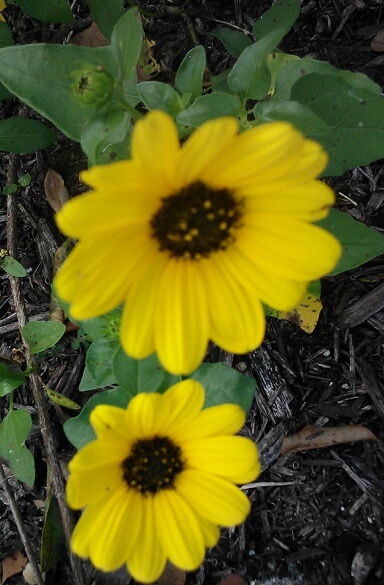 This may be my new favorite plant, a native groundcover used for controlling beach erosion, the Dune Sunflower was planted in the middle of summer in an unirrigated bed by the side of the road. I bought the plants on sale for $1.oo(US) each because they looked bad and the grower wanted to get rid of them. A couple of months later and a little TLC and these are madly blooming with little care. What’s not to like? 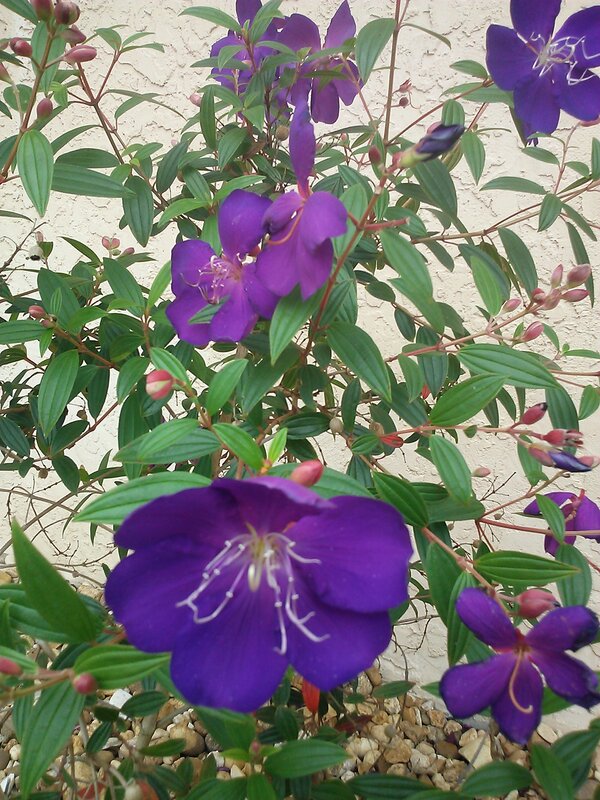 The Tibouchina is another sporadic bloomer, love the purple though. The Shrimp Plants have been blooming nearly nonstop since last spring on my porch. I have unsuccessfully tried to root them. 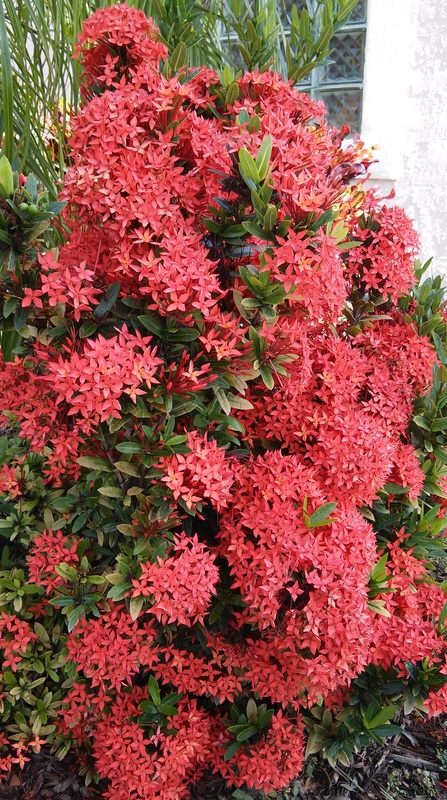 Some of these plants bloom nearly year round like the Ixora below, I call this the Azalea of South Florida because most people who garden have a few. A reliable plant that comes in several colors and sizes. I feel as if I have been making steady progress in the garden having started it almost three years ago. I have definitely learned a lot about tropical plant material, and am looking forward to learning more. Then replant my herb garden, I found Lemon Thyme here last week after a three year quest and am very happy. Happy New Year and Happy Gardening. For many years I thought the plant that separated True Gardeners from posers was the Mahonia bealei. I provided six Landscape Design Consultations weekly for years, talking with many, many people and over the years the appreciation of that particular plant rang true for me and separated the True Gardeners in my mind. True Gardeners are people who have the ability to separate the beauty of the plant from its less attractive attributes. Sometimes this is a seasonal thing sometimes it is purely the ability to appreciate nature. Mahonia bealei is commonly known in the US as Leatherleaf Mahonia. 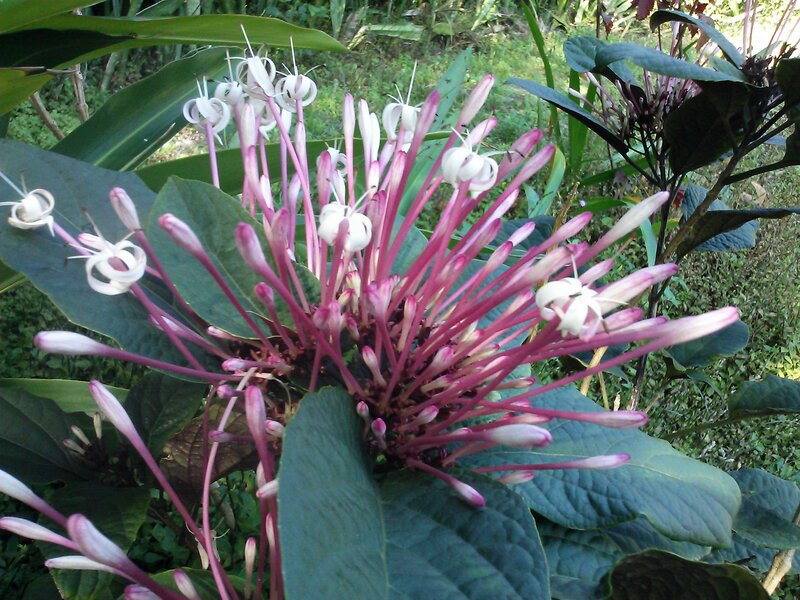 It is one of those plants that is difficult to kill except in full sun. It doesn’t really die in full sun it just suffers and turns red. Probably sunburn. Otherwise, it is thorny, reproduces copiously via birds and generally stabs the passerby. Many people detest this plant and for good reason. The reasons we appreciate this plant are many. Reliable under most circumstances, it remains cheerfully Evergreen through the iciest of weather. The holly like foliage can be used in holiday arrangements. I have spray painted the leaves metallic colors for wreaths (leather gloves required). The yellow flowers are borne in winter and are followed by grape like fruits that are enjoyed by numerous species of birds. 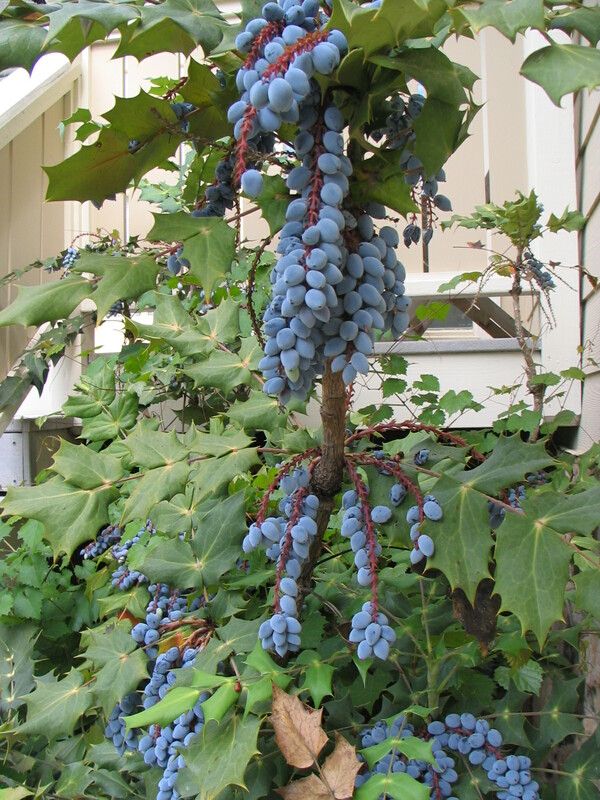 Hence, another common name, the Oregon Grape Holly. My mother had an enormous specimen she tree-formed to screen her garbage cans. We usually admired the flowers at Christmas, New Years or even Valentine’s Day depending on the weather. The only other flowers in the garden were pansies planted as annuals or Hellebores. Oddly enough, almost everyone who enjoyed these referred to them as Mahonias. That was it. This may be ascribed to Americans not being particularly concerned with botanical nomenclature or just simply that was the most prolific Mahonia in the area. That said, plant taxonomy hasn’t worried me too much unless it defines a plant that I need to specify. Botanical nomenclature I love, plant tax not so much. I think there is a plant like the Leatherleaf Mahonia the world over..not sure what it is in the UK or Australia; I was emailing with Karen (smallhouse/BIGGARDEN), a fellow Florida blogger about a weed we both like yesterday – Florida Snow. Karen identified this as Richardia grandiflora, which works for me. 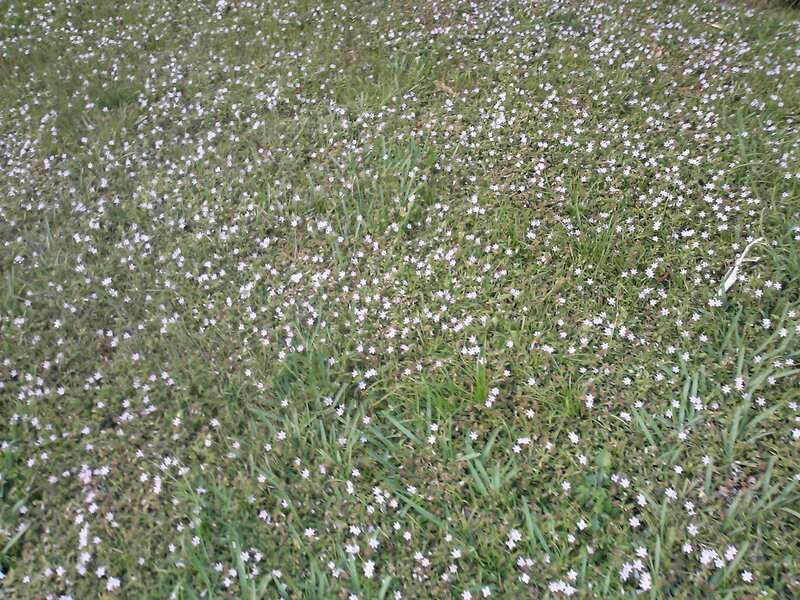 It is a horrible creeping weed if you are a turf purist, as gardeners we love the white flowers that look like snow in our backyard meadows..and we need no chemicals! My greyhounds run amuck in this and I have no worries. And really if you have moved this far south, I think this is sufficient snow. My husband, the turf purist, is not really enjoying the flowers.